A Monk by the Sea, Caspar David Friedrich. Source. Whatever is fitted in any sort to excite the ideas of pain, and danger, that is to say, whatever is in any sort terrible, or is conversant about terrible objects, or operates in a manner analogous to terror, is a source of the sublime; that is, it productive of the strongest emotion which the mind is capable of feeling. 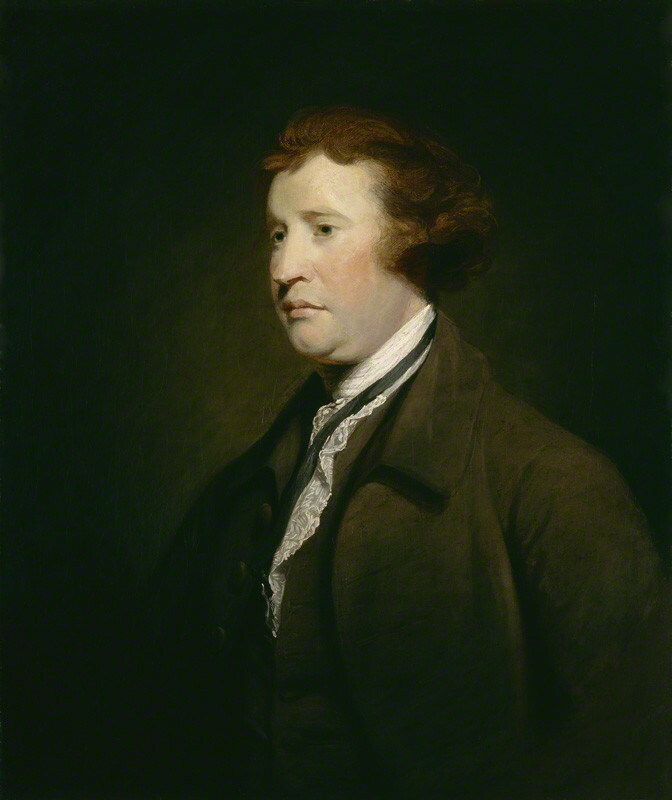 A painting of Edmund Burke, from the studio of Joshua Reynolds – source. Yet for all its fear, the sublime is a form of delight – humans are attracted to such terrible experiences. Consequently, the Burkean sublime relates to experiences that present a complex and almost contradictory mixture of emotions. As one is overwhelmed by unpleasant forces beyond one’s control and capacity of reason, within this springs a sense of delight. Later in the book Burke would ascribe this phenomenon to existential awareness. I cannot see the heavings of this prodigious bulk of water, even in calm, without a very pleasing astonishment; but when it is worked up in a tempest, so that the horizon on every side is nothing but foaming billows and floating mountains, it is impossible to describe the agreeable horror that rises from such a prospect. A troubled ocean, to a man who sails upon it, is, I think, the biggest object that he can see in motion, and consequently gives his imagination one of the highest kinds of pleasure that can arise from greatness. JMW Turner, The Shipwreck – source. How is the sea, the bearer of the sublime, represented in classical music? Below, I present a selection of six pieces associated with images of the sea. The thing that will strike the first-time listener most strongly may be the presence, through the whole work, of the sea reflecting the circumstances of its composition, at home in a tiny isolated cottage on a remote island off the north coast of Scotland, on a clifftop overlooking the meeting of the Atlantic Ocean and the North Sea. Here the sound, sight, and mood of the sea influences your whole existence, all your perceptions, and—particularly in winter, shudders right through the stones of the house, and indeed through your very bones. Jean Sibelius (1865-1957) is often cited as one of the most influential composers in the development of 20th century British classical music, including that of Maxwell Davies. Both composers experimented with symphonic structure; both also had a deep affinity for nature, and through their music communicated something jointly elemental and emotional. Sibelius’s musical world is deeply rooted in 19th century Romanticism (sweeping melodies, dramatic devices, etc.) and portrays the evocative atmosphere unique to his native country. These traits are present in the seascape-based The Oceanides. It is a tone poem of two contrasting faces of the sea: a scene of blithely playing sea nymphs, and a storm. Yet the transformation is done utterly naturally, and the overarching warmth the music was imbued with before the turning point is recalled in the serene closing section. Neither Richard Wagner (1813-1883) nor Anton Bruckner (1824-1896), men of Germany and Austria respectively, had substantial experience of living at sea. Yet given that both were renowned for composing music of unworldly monumentality, their take on the sea is somewhat fitting. Wagner’s overture to The Flying Dutchman sets the mood to his most dramatic opera at the time. The opera portrays a spiritual voyage where the vanity of man to conquer nature – particularly the sea – provokes the devil. Amidst the wild tempest, the characters are redeemed only through fidelity of love. Bruckner’s Helgoland is a late work for orchestra and choir. The text of the setting illustrates the divine intervention that saves the Saxon people from the invading vessels of the Romans on the Frisian island of Heligoland. As with the Flying Dutchman, the dangers associated with the sea are omnipresent – in this case not necessarily the sea per se, but it is difficult to not acknowledge the sea as an appropriate setting for human helplessness and redemption. A man sat on the shore and the various pictures of nature passed before his eyes. Bright sun shone in the sky, the sea was calm. Suddenly a raging whistling gust of wind arose, followed by another. The sky grew dark, the sea became agitated. The elements launched into a struggle, relentless, with a great roaring, with majestic force. A violent storm burst. But the tempest passed away, the sea became calm again. The sun shone anew over the calm surface of the water. Blue Sea – Wilt welcome me? Oh Sea – look graciously! Say Sea – take Me? Like many works by this composer, the sound-world may feel exotic to Western ears, because of Takemitsu’s lack of formal Western musical training and his endorsement of East Asian instruments and melodies. The eclecticism is further enhanced by the composer’s impeccable ear for glowing sonority and subtlety of expression. One is at times reminded of the sensual spirituality of Olivier Messiaen and the evanescent beauty of Claude Debussy. In all of the above works, traces of the Burkean sublime – an experience of threat-tinged delight – can be commonly detected, especially in those works by Wagner and Glazunov. Yet it is also noticeable that not all selected works fit into this taxonomy. Takemitsu’s gentle sea presents a somewhat meditative picture. And while Sibelius’s sea certainly contains elements of tension, the overall impression is hardly terrorising. What can this mean – does the sea in itself not exhaust the experience of the sublime? One thing seems clear: works of the sea suggest scale and power. Even in the softest utterances, one hears a lofty sense of inner strength. These works promise a musical drama concerning the ineffable, transcendental and invariably ambitious. It is worth noting that most works concerning the sea – even beyond my selection – take on forms of large orchestras, which can create an expansiveness and depth not easily achieved by smaller ensembles. A simple conclusion of gross generalisation would diminish the complexities and realities of both musical and sublime experiences. I leave you with the last lines of Henry Wadsworth Longfellow’s poem, The Secret of the Sea. Young-Jin Hur is a PhD candidate in psychology at University College London, an ardent record collector and a self-professed Anton Bruckner enthusiast. He has written concert notes for the Seoul Arts Centre and contributes to one of Korea’s largest classical music online communities, 클래식에 미치다 (‘Crazy about Classical Music’).